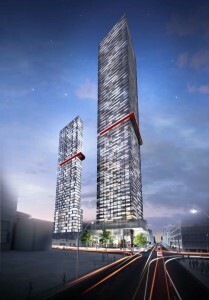 There’s a unique sales opportunity coming up at one of Toronto’s most exciting new condo projects. Act now before the sales office opens to the general public. This is only possible through a VIP Condo Broker such as myself. Inside the residential space, stunning 20 and 30? high lobbies will provide a dramatic welcome, and will feature 24 hr personal concierge services. Available suites range in size from 466 to 1240 sq ft (consisting of 1 bedrooms, 1 bedroom plus dens, 2 bedrooms and 2 bedroom plus dens). As always, Varacalli has designed spacious units with large windows and balconies in every suite. Suites are starting at $316,900, offering exceptional value for such a premiere location. Parking spaces are $58,000 (available for 2 bedroom units over 700 sq ft). Lockers are $5,000. Tentative occupancy is August 30, 2017.